Tailrace, what tailrace? 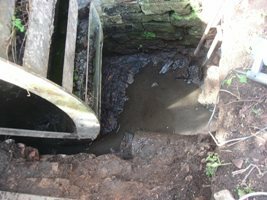 When we first started looking at the mill the waterwheel stood in a muddy pit that had a single six inch drain pipe stopping it from filling with water. The pipe is visible at the bottom of the picture. The waterway had been completely filled in. Clearly we were going to have to clear out the infill and restore the race to its original capacity. Without this we might as well give up on the entire restoration. 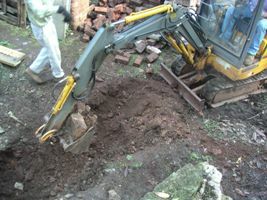 The infill was terrible stuff to dig out; soil mixed with old bricks, bottles, fertilizer sacks and general rubbish. A few phone calls, and we managed to borrow a small JCB and we soon had this hard at work. All went well for a couple of working days. The sun shone, the weather was dry and the JCB worked as well as its driver knew how to make it. Using the levers to control the digging bucket effectively is not quite as intuitive as it might appear to viewers of Time Team! The real problem with the digger was simply that it wasn’t big enough, or being a bit more precise, it wouldn’t reach down far enough. By the 29th of the month we had gone as deep as we could with the digger and it was obvious that we were going to have to dig the last bit by hand. 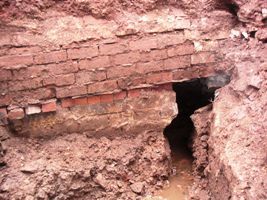 We had cut a narrow channel through to the wall of the brick culvert so that the wheel pit was draining but there was still a lot of spoil to shift. The only answer was a bucket chain. On the 31st we set to work with a will and in the course of the day we moved an estimated one and a half tons (or tonnes) of wet clay soil from the bottom of the hole. The picture was taken by a visitor and includes one of the very few images of the webmaster. From the left and going clockwise we have Martyn, Max, John D, Colin, John N and Richard. The south side of the tailrace was reasonably well preserved but the facing wall was conspicuous by its absence. We think that it was the collapse of this side that led to the tailrace being filled in, probably in the 1960’s judging by the age of the rubbish in the infill. At this stage we were feeling pleased with ourselves, but what we had really got was a very large, very wet hole in the ground. 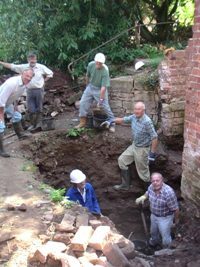 We had extended the waterwheel pit as far as the side of the culvert that takes the mill stream past the mill and on into the farmyard. The next bit was going to be tricky. Looking back at the notes for early September it seems as though the restoration of the tailrace had hit a wall. In fact that is more or less what had happened. 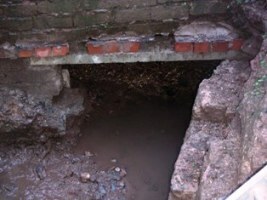 The culvert that carries the stream from the mill pool under the return road and between the mill and the barns is a brick structure with barrel vaulting. In digging out the tailrace we had uncovered the side of this culvert and to our amateur eyes it looked a little shaky. At some time there had been a steel support embedded in the side of the culvert as a lintel for the tailrace opening but time and the damp environment had reduced this to a few flakes of rust. While we pondered how to open up the side of the culvert without the vaulting collapsing into the stream we got on with rebuilding the sides of the race. We had already decided that we would have to bridge over the race, but at least that meant we did not have to be too authentic in our building methods. Walls go up much faster with new concrete blocks than they do if you build with hand-cleaned recovered bricks. As with everything we have done with the mill, we have received a great deal of help, support and advice from professionals. 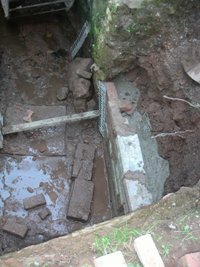 We still had the problem of holding up the culvert while we broke through the side and the advice was “Just use needles, it’ll be OK” We believed them, of course, but by the end of September we had not put the advice to the test. We concentrated on other jobs for the first part of the month but on the 12th we finally bit the bullet and knocked holes through the side of the culvert and inserted short lengths of scaffold pole, needles, supported on short trench jacks. 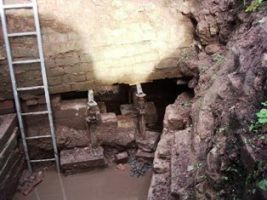 This arrangement meant that we could now knock down the remaining brickwork separating the tail race from the culvert but not until we had installed a new lintel to replace the rusted steel. By the 17th we had acquired a suitable concrete lintel and were all ready to go. 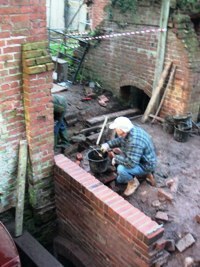 The lintel was eased into place and left for the mortar to set. 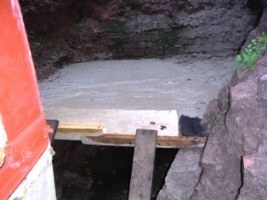 A week later we were able to remove the needles and fully open the tailrace through to the culvert. For the first time we had a good idea of water levels around the waterwheel and in the stream. Actually they are a bit higher than we would like because we are sure that the wheel would be more efficient if it was clear of the water but John Stinton has checked out the levels for us and the water level when the wheel was first installed cannot have been very different to where it is now. The notes start to tell of icicles and cold weather so it is not surprising that enthusiasm for paddling in the mud at the bottom of the tailrace was low. Even so we had placed more lintels over the race and reinforced them with steel mesh and poured concrete by the 14th. We had already decided that we would build an arch over the entrance to the tunnel we had just formed and after a fair amount of discussion we got on with it. Dave Lowe made the form-work and Martyn and Derek laid the bricks. By the end of the month the arch was complete and the wall that retains the alleyway was well on its way. The wall is built with recovered bricks on the outside, but the real load bearing part of the wall is built with concrete block work. The first week in December saw the backfilling of the hole over the tailrace. The weather was less than good, cold and wet in fact, but the end of a major task was now well in site. As it turned out we put the finishing touches to the retaining wall on the last working day before Christmas. This was a significant part of the restoration of the watermill as without an open tailrace we could never have a working watermill. Apart from the archway at the bottom of the wall there is very little visual difference to this area of the mill to the way it looked before we started, but it really did take a lot of effort to get it to this state. Now we know the water will flow away we can get on with restoring the waterwheel.